I continue my series on the Korean irregular verbs with the ㅂ irregular verbs. Like the previous irregular verbs, this group is knows as such because the verb stem ends in ㅂ. This group has verbs such as 쉽다 and 맵다. Attention is needed as this group can be tricky. 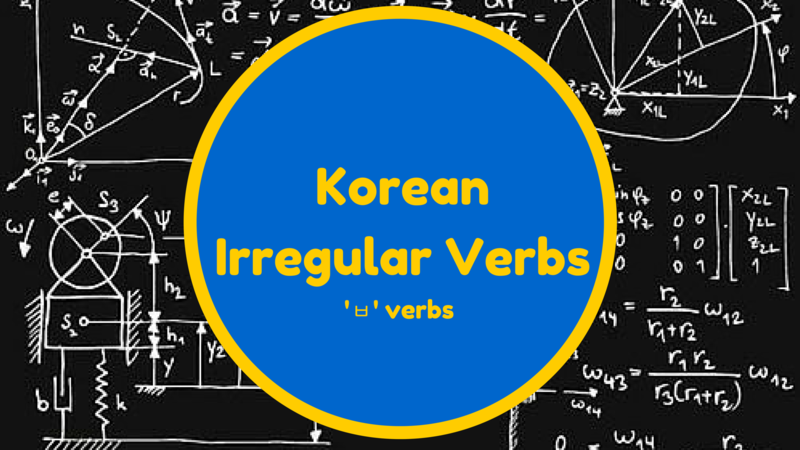 I continue my series on the Korean irregular verbs with the ㅂ irregular verbs. Like the earlier irregular verbs, this group is knows as such because the verb stem ends in ㅂ. This group has verbs such as 쉽다 and 맵다. Attention is needed as this group can be tricky. The ㅂ irregular verbs have the same main rule as the ㅡ irregular verbs that I have already explored. The verbs will show their quirkiness whenever the verb ending used starts with a vowel. If the verb ending starts with a vowel, the ㅂ transforms into 오 or 우. There are only two ㅂ irregular verbs where the ㅂ will change into 오. The first verb is 돕다 (to help, to assist) and the other verb is 곱다 (to be charming, to be lovely). All other ㅂ irregular verbs will have their ㅂ change into 우. However, to make everything even more ‘fun’, not all verbs with a stem ending on ㅂ are irregular. Some of them are very regular. Some regular ㅂ verbs are: 입다 (to wear), 좁다 (to be narrow), 씹다 (to chew) and 잡다 (to catch). 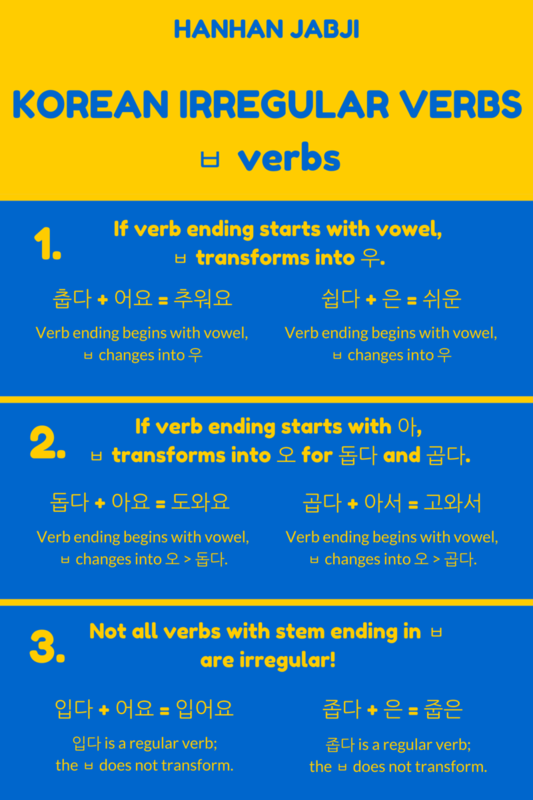 As always you also need to keep in mind all regular Korean spelling rules while conjugating the ㅂ irregular verbs. The ㅂ irregular verbs are a fun bunch that have a quirkiness that requires some attention. Some are regulars and some change differently than most. As with the ㅡ irregular verbs verbs and the ㄹ irregular verbs, I selected a handful of ㅂ irregular verbs to learn these verbs and, of course, expand my Korean vocabulary. I only add irregular verbs so any regular verb that has a stem that ends in ㅂ, is not included. My choice is: 쉽다, 어렵다, 맵다, 덥다, 춥다, 무겁다, 돕다*, 곱다*, 뜨겁다, 무섭다, 싱겁다, 귀엽다, 가볍다. As with the previous post, I also created a Memrise course for anyone who wants to learn these verbs with me.